Sub-division - Hajipur, Mahua, Mahnar. Best season - Nov. - Feb.
Road Route - 65 Km. from Patna. In Buddhist period (6th Century BC – 7th Century BC), in Kushan Dynasty (2nd Century BC – 1st Century AD), in Mauryan Dynasty (4th Century BC – 2nd Century AD), in Gupta Dynasty (4th Century AD – 6th Century AD), in Pal Dynasty (8th Century AD- 12th Century AD) — this region was the main land of famous dynasties & great kings of Ancient Indian history. On the northern bank of river ‘Ganga' (Ganges), Vaishali - was the important Trade Centre in 'North India'. This trade centre was also unique because of on the southern bank of river ‘Ganga’, Patliputra - was a very important 'political centre' in India. In 6th century BC this place was the capital of 'Lichhavi Sangh' - which in considered as Ancient & first Democratic State in the world. 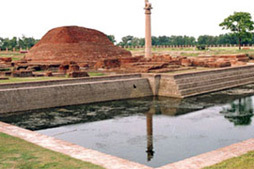 Ancient Vaishali is a very important place for Buddism & Jainism also. At this place, Lord Buddha & Lord Mahavira spent great parts of their lives. Now it is an important tourist place of 'Suffi-circuit' & 'Ramayan circuit' as well. 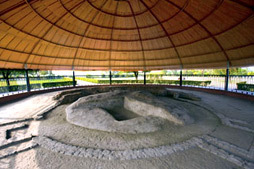 Vaishali is an internationally important tourist place for archaeological sites also. Many archaeological sites were disclosed by scientific & archaeological excavation in the years 1861-64, 1903-04, 1913-14, 1950, 1958-62 and 1976. Archaeological remains are preserved in Vaishali Museum & Patna Museum. Chinese traveller Fa-hian (405 AD - 411 AD) and Hiuen-Tsiang (629 AD - 645 AD) have described Vaishali in great detail. Location: 35 Km from Hajipur, district headquarter of Vaishali, beside 'Abhishek Pushkarini tank. Importance: Now this holy place is known as 'Buddha Asthi-Kalash Asthal'. 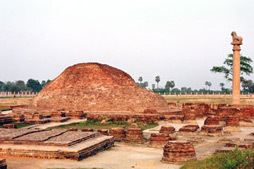 Lichhavi's built (in 5th Century BC) Lichhavi Stupa with the 8th part of holy mortal remains (Relic) of Lord Buddha, in Vaishali, at this place.In 1958 - 1962, in an archaeological excavation this Stupa came into light. The Relic Casket was discovered in this excavation. The casket contained, besides the ashes of Lord Buddha mixed with earth, a piece of Conch, pieces of Beads, a thin Golden Leaf and a copper punch-marked Coin. Since 1972, the holy "Relic of Lord Buddha' has been preserved in Patna Museum. This excavation also revealed that the Stupa at Vaishali, was enlarged & repaired 3 times in between 4entury BC - 1st century AC, during Maurya, Shung & Kushan dynasty, which is also seen today. Historical fact: Lord Buddha attained Mahaparinirvana at Kushinagar (U.P. ); the mortal remains of Tathagat were kept in the 'parliament house’, of the Republic of Mallas. However, many republics and states desired to possess a portion of his mortal remains on the basis of their relation & closeness with the Blessed one.According to the Mahaparinibban-Sutta of Digha Nikaya, the mortal remains of Lord Buddha were divided into 8 parts & given to; 1. King Ajatshatru of Magadh (situated at Rajgir, Nalanda), 2. The Mallas of Kushinagar (U.P. ), 3. The Mallas of Pava (Saran, Bihar), 4. The Brahman of Vetha Dipa (at Bettiah, Bihar), 5. The Bulis of Alakappa (Saran, Bihar), 6. The Sakyas of Kapilvastu (U.P. ), the Koliyas of Ramagram (Nepal) & 8. The Republic of the Licchavi of Vaishali (Buddha Asthi-Kalash Asthal). Drona, the Brahman who distributed the mortal remains of Lord Buddha, Kept with himself the Tumba (pitcher), which contained the 'Corporeal Remains'. Drona built Drona Stupa (at Siwan, Bihar) on this holy pitcher. After the distribution, the Moriyas of Pippalivana (East Champaran, Bihar) came and claimed their share in the Holy Relic. They got only the remaining Angara (the burnt wood) and built the Angaraka Stupa (at Lauria Nandangarh, Champaran, Bihar). Drona Stupa & Angaraka Stupa are important as the mortal remains was divided into 8 parts after the 'Mahaparinirvana of Lord Buddha'. As per Buddhist literature, King Ashoka (during his reign in 273 BC - 329 BC), after 270 years, after Mahaparinirvana, in 543 BC, collected three-fourth mortal remains of Lord Buddha from 7 Stupas (relic casket) - except the Koliyas of Ramagram (situated at Nepal) - and divided mortal remains into 84,000 parts & established & built Ashoka Stupa & Ashoka Pillars on the Nirvana - path of Lord Buddha from Lumbini to Kushinagar. Most of the Ashoka Stupas vanished in the 2500 years time- period (because most of the stupas were built by soil). Now, in Bihar, we can see 4 Ashoka Stupas also. 1. Ashoka Stupa (at Lauria Areraj, East Champaran), 2. Ashoka Stupa (at Rampurva, West Champaran), 3. Ashoka Stupa (at New Rajgir, Nalanda), 4. Stupa (at Chakramdas Village, Vaishali). 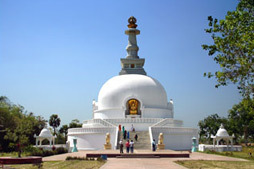 Kolhua Buddha Stupa, (in the memory of main desciples Anand of Lord Buddha, by Republic of Licchavis) in Kolhua, Vaishali. Amrapali Stupa (in the memory of one of the follower - great dancer Amrapali of Magadh Dynasty in Tola-dargaah village, Vaishali. Sujata Stupa - (in a major incident before Nirvana - built & developed by 3 Dynasties) in Bodhgaya, Gaya. Sariputra stupa (in the memory of one of the main desciple of Lord Buddha) in the Nalanda Open University ruins area, Nalanda. Ajatsatru Buddha Stupa (in the memory of main desciple Anand of Lord Buddha) by Ajatsatru, King of Magadh), in Rajgir, Nalanda. Kesaria Buddha Stupa (in a major incident before Mahaparinirvana, by Republics of Licchavis, Vaishali (after Lichhavi Stupa at Vaishali) in Kesaria, West Champaran. Location: 35 Km. from district headquarter, Hajipur. Beside Abhishek Pushkarini Pond, Vaishali. Importance: Buiilt by Indosan Nipponji, Japan. 146 Feet High, 120 feet in diameter, claimed to be the highest Buddha Stupa (Rajgir, Vishwa Shanti Stupa-120 feet high) - in World. On 23rd Oct.1996, then President Dr. Shankar Dayal Sharma, inagurated this 'Buddha Stupa'. Location: 3.5 Km north-west from Vishwa Shanti Stupa, at Kolhua. Importance: Built by King Ashoka (249 century BC), 24.5 feet high (43.5 feet high from base) polished, single piece, of red sand stone – Ashoka Pillar is the main attraction of “Maurya Dynasty’ in Vaishali. A life size figure of a lion is placed on the top of the pillar. King Ashoka - built 30 known Ashoka Pillars. 5 Ashoka Pillars are situated in Bihar as - one Ashoka Pillar in Kolhua, Vaishali, two Ashoka pillars in Rampurva, W. Champaran, one Ashoka Pillar in Lauria Nandangarh, W. Champaran & one Ashoka Pillar in Areraj, E. Champaran. (Ashoka Pillar of Kolhua, Vaishlai & Lauria Nandangarh, E. Champara – are the only developed spots). Near Ashoka Pillar, a Buddha Stupa was built by Licchavi's on the mortal remains of Anand, the main desciple of Lord Buddha. This stupa was enlarged & repaired in Maurya Dynasty & other in different time period. According to ‘Divya Vadan’ king Ashok had developed this place & spent 10 million golden coins. Beside Ashoka Pillar, on the south, there is an ancient pond now known as “Ram kund” – is related to Buddhist period Merkathhrid (near two storeyed shelter-house of Lord Buddha). Ashoka had built & established 'Pillar & Stupa' beside this ‘Merkathhrid’. Now we can see the 'ruins of this ancient shelter house'. 0.5 Km from Ashoka Pillar, Kolhua - there are two ancient undeveloped, Stupas are situated in Bakhra village, Thana Saria & district Muzaffarpur. One stupa is 183 feet in diameter & 25 feet high & the other is 179 feet in diameter & 23 feet high. Location: 35 Km from district headquarter Hajipur, 300 meters from 'Raja Vishal Ka Garh', at Tola-Gargaah village of Vaishali Panchayat. Importance: A Mound of 24 feet high & diameter of 140 feet. Now this place is known as 'Pir Ka Mazar'. 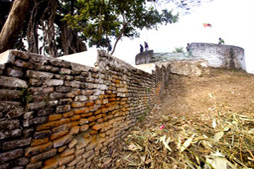 In Buddhist period, this place was the Mango-Garden (Amravana) of the great dancer Ambapali (Amrapali) of Magadh dynasty. According to Mahparinibbansuta, Lord Buddha stayed in this Amarvana — in this list visit of Vaishali. On this holy place Buddha announced his Mahaparinirvana after staying here for a few days, he went to Pava (Siwan). On his last visit to Vaishali - Knowing the news, Amrapali, the great dancer, came in this Amravana (mango garden) and invited Lord Buddha & his desciples for dinner.She gifted this Mango-Garden to the 'Bhikshuk Sangh' in the regard of Buddha & also became his 'first female desciple' - at this time. After this Mahaparinirvana (543 BC) in the memory of Lord Buddha, Stupa was built at the place of Amravana which was later, known as 'Ambapali stupa'. According to Fa-hian (405 AD - 411 AC) he saw on this place the 'ruins of Ambapali stupa' at 3 lee (300 meters) of 1st Parliament house (Raja Vishal Ka Garh) of Vijji sangh. Now this place is known as 'Pir ka Mazar'. Mausoleum of Hazrat Makhdum Shah Kazin (Shekh Kazin Suttari), who came here, in 15th century AD, and spread siffism. Loacation: 35 Km. from district headquarter Hajipur, South from Abhishek Puskarini at Chakramdas village. Importance: In Buddhist period, on this place there was a 'holy tank' near to a 'Shelter-House' (Chapaal Chaitya) where Lord Buddha walked & took shelter on his Vaishali trip. Lord Buddha liked this place becaue this place was also related to Buddha's past life. According to Hiuen-Tsiang, Lord Buddha told his past life story to his desciples that - in the past life he, with his thousand brothers, surrendered their arms in front of his mother. In the past life he was 'Saharsha Buddha'. In the decade of '60's, K.P. Jaysawal Institute, Patna excavated this place. In the excavation many rare antiquities, styli of bone, punch mark & cast coins, seals & sealings, terracotta etc. were found.